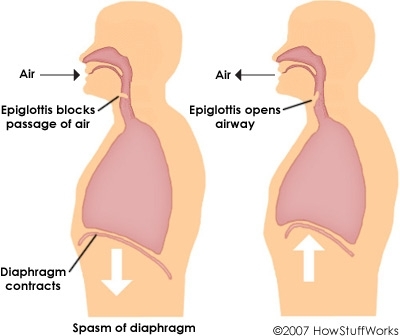 Wikipedia - "A hiccup or hiccough (pronounced /ˈhɪkʌp/ HICK-up) is a contraction of the diaphragm that repeats several times per minute. 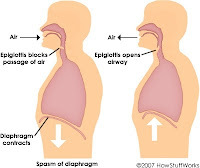 In humans, the abrupt rush of air into the lungs causes the vocal cords to close, creating a "hic" sound." Hiccup can be pretty annoying ... have you ever tried to hold the breath as long as you can? or drink the water and pinch your nose? or simply just get someone to surprise you? I've tried it ... the cure of the hiccup that people normally mention. Take a table spoon of sugar and put the whole sugar in your mouth and shallow it, please exclude the spoon. it's a bit difficult to shallow it but to my surprise .... the hiccup is gone. so next time you have a hiccup don't forget to try this method.